Twin Cities World Refugee Day – more information & link to website here. 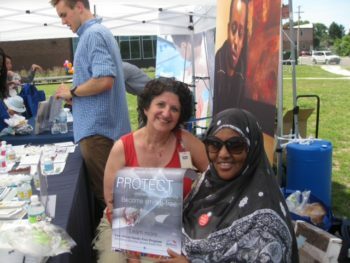 The heat and humidity was sweltering this past Saturday, June 11, 2016 at Twin Cities World Refugee Day, but it was not able quell the compassion, pride, and joy surrounding this incredible event. The live dance performances, ≈ 30 different nonprofit and social service agencies, and incredible volunteer efforts made for a wonderful experience. The mission of the day, to be “a family-oriented day of celebration that highlights the stories, arts, and cultures of the 101,800+ refugees in Minnesota and the diversity of cultures, experiences and assets they bring to our community” was absolutely accomplished! 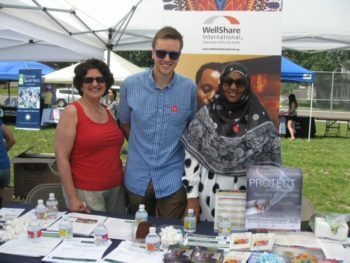 Tha Dha and Adar manage WellShare’s information table at the Twin Cities Refugee Day celebration. As a summer intern, I asked to see the impact that WellShare makes on the communities that it serves. My initiative was met with numerous opportunities! I started work on Monday (June 6th), and within a week I was able to share the good news and the various programs WellShare offers to the larger community. I accompanied Eugenia Canaan (Program Manager), Adar Kahin (Community Organizer), and Tha Dha Loo (Community Health Worker) to this networking and informational event. Eugenia, Matthew, and Adar pose for a quick picture while presenting information. Throughout the day we met with potential volunteers, community members, and other organizations looking for partnerships. Eugenia and Adar showing off the East African Smoke-Free Program’s secondhand smoke poster. This event was a wonderful way to see the vast array of nonprofit services available to new arrival individuals and families. 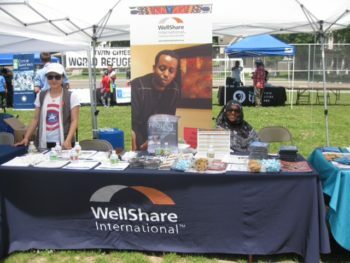 Many people were impressed with the areas of service WellShare International provides (as was I), including smoke-free literature and programming, reproductive health materials and programming, and youth-focused health initiatives, to name a few. During the event, I watched and participated in cultural dances, talked with other organizations about their role in public health, and absorbed the sights and smells (there were a few food trucks present) of the celebratory atmosphere. I could not be more pleased with my first experience of community outreach. I look forward to learning more about WellShare and becoming a more effective spokesperson for this engaging organization. Thank you to WellShare for this opportunity, to Mary Niedermeyer, Kari Wheele, Va Yang Co-chairs of the event, and to the numerous volunteers that made this day possible.